Eider, Georgia | Artists | Canadian Art Prints & Winn Devon Art Group Inc. The alter ego of Christine Seigneuret, Georgia Eider returned to making pictures after taking a twenty-five year detour as a self-employed textile designer. Named after her two Labrador retrievers Georgia & Eider, the artist is inspired by their approach to life, their boundless energy, cheerfulness, purity of spirit and alimitless willingness to love and forgive. Born and raised in Vancouver, the daughter of European immigrants and one of four sisters, Georgia Eider spent her childhood drawing and painting. She attended the Emily Carr College of Art and Design and the University of B.C. after which she began designing and hand painting garments which morphed into a career as a designer creating unique and artful clothing and supplying retail stores in Canada and the US. 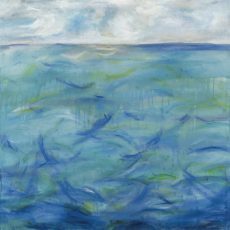 Today, Georgia Eider returns to her childhood love of painting, choosing subjects that delight and inspire and that are often charming and light but can be also serious and sublime. Her work process is one of searching and teasing out of the application of paint and mark making, a statement about life that feels truthful and right.